Hokkaido (, Hokkaid?, literally "Northern Sea Circuit"), formerly known as Ezo, Yezo, Yeso, or Yesso, is Japans second largest island; it is also the largest and northernmost of Japans 47 prefectures. The Tsugaru Strait separates Hokkaido from Honshu, although the two islands are connected by the underwater railway Seikan Tunnel. 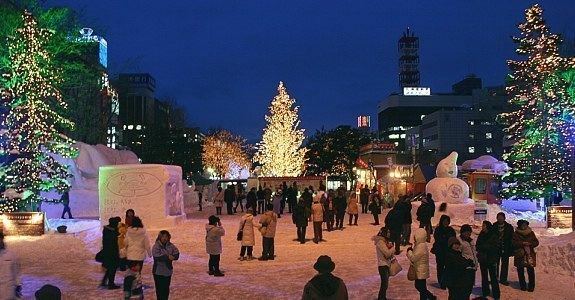 The largest city on Hokkaido is its capital, Sapporo, which is also its only ordinance-designated city. Hokkaido was settled by the Ainu, Nivkh, and Orok peoples 20,000 years ago. The Nihon Shoki, finished in 720 AD, is often said to be the first mention of Hokkaido in recorded history. According to the text, Abe no Hirafu led a large navy and army to northern areas from 658 to 660 and came into contact with the Mishihase and Emishi. One of the places Hirafu went to was called Watarishima (), which is often believed to be present-day Hokkaido. However, many theories exist in relation to the details of this event, including the location of Watarishima and the common belief that the Emishi in Watarishima were the ancestors of the present-day Ainu people. During the Nara and Heian periods (710–1185), people in Hokkaido conducted trade with Dewa Province, an outpost of the Japanese central government. From the Middle Ages, the people in Hokkaido began to be called Ezo. Around the same time Hokkaido came to be called Ezochi (, lit. "Ezo-land") or Ezogashima (, lit. "Island of the Ezo"). The Ezo mainly relied upon hunting and fishing and obtained rice and iron through trade with the Japanese. During the Muromachi period (1336–1573), the Japanese created a settlement at the south of the Oshima Peninsula. As more people moved to the settlement to avoid battles, disputes arose between the Japanese and the Ainu. The disputes eventually developed into a war. Takeda Nobuhiro killed the Ainu leader, Koshamain, and defeated the opposition in 1457. Nobuhiros descendants became the rulers of the Matsumae-han, which was granted exclusive trading rights with the Ainu in the Azuchi-Momoyama and Edo periods (1568–1868). The Matsumae familys economy relied upon trade with the Ainu. They held authority over the south of Ezochi until the end of the Edo period in 1868. The Matsumae clan rule over the Ainu must be understood in the context of the expansion of the Japanese feudal state. Medieval military leaders in northern Honsh? (ex. Northern Fujiwara, Akita clan) maintained only tenuous political and cultural ties to the imperial court and its proxies, the Kamakura Shogunate and Ashikaga Shogunate. Feudal strongmen sometimes located themselves within medieval institutional order, taking shogunal titles, while in other times they assumed titles that seemed to give them a non-Japanese identity. In fact many of the feudal strongmen were descended from Emishi military leaders who had been assimilated into Japanese society. The Matsumae clan were of Yamato descent like other ethnic Japanese people, whereas the Emishi of northern Honshu where a distinctive group related to the Ainu. The Emishi were conquered and integrated into the Japanese state dating back as far as the 8th century, and as result began to lose their distinctive culture and ethnicity as they became minorities. 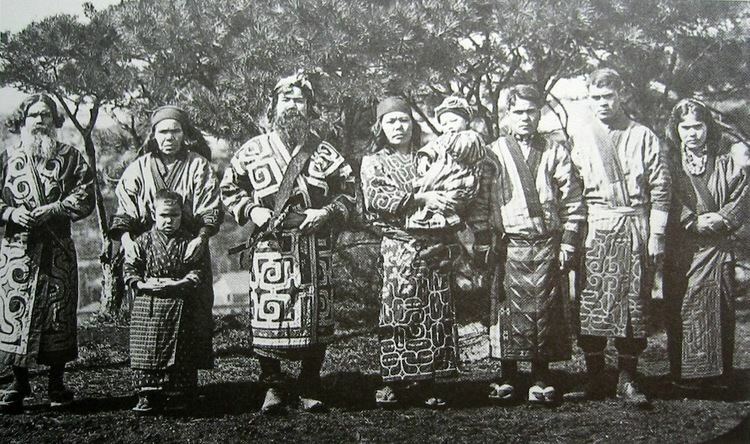 By the time the Matsumae clan ruled over the Ainu most of the Emishi were ethnically mixed and physically closer to Japanese than they were to Ainu. This dovetails nicely with the "transformation" theory that native J?mon peoples changed gradually with the infusion of Yayoi immigrants into the T?hoku rather than the "replacement" theory which posits that one population (J?mon) was replaced by another (Yayoi). There were numerous revolts by the Ainu against feudal rule. The last large-scale resistance was Shakushains Revolt in 1669–1672. In 1789, a smaller movement, the Menashi-Kunashir Rebellion, was also crushed. After that rebellion the terms "Japanese" and "Ainu" referred to clearly distinguished groups, and the Matsumae were unequivocally Japanese. In 1799–1821 and 1855–1858 the Edo Shogunate took direct control over Hokkaido in response to a perceived threat from Russia. Hokkaido was known as Ezochi until the Meiji Restoration. Shortly after the Boshin War in 1868, a group of Tokugawa loyalists led by Enomoto Takeaki temporarily occupied the island (the polity is commonly but mistakenly known as the Republic of Ezo), but the rebellion was crushed in May 1869. Ezochi was subsequently put under control of Hakodate-fu (), Hakodate Prefectural Government). When establishing the Development Commission (, Kaitakushi), the Meiji Government introduced a new name. After 1869, the northern Japanese island was known as Hokkaido; and regional subdivisions were established, including the provinces of Oshima, Shiribeshi, Iburi, Ishikari, Teshio, Kitami, Hidaka, Tokachi, Kushiro, Nemuro and Chishima. 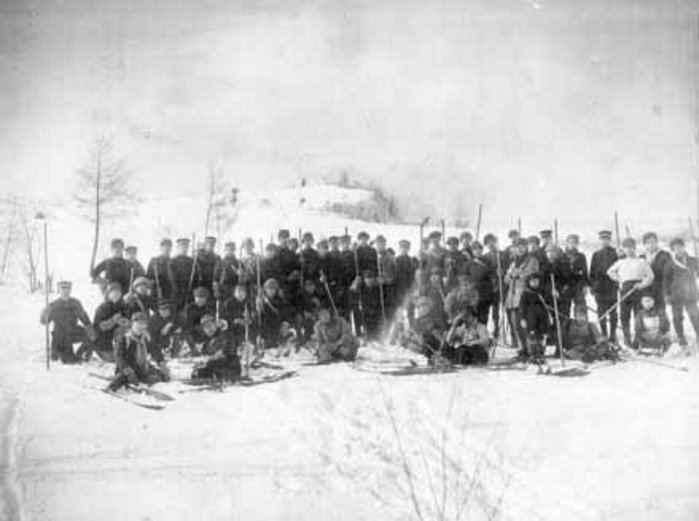 The primary purpose of the development commission was to secure Hokkaido before the Russians extended their control of the Far East beyond Vladivostok. Kuroda Kiyotaka was put in charge of the venture. His first step was to journey to the United States and recruit Horace Capron, President Grants Commissioner of Agriculture. From 1871 to 1873 Capron bent his efforts to expounding Western agriculture and mining with mixed results. Capron, frustrated with obstacles to his efforts returned home in 1875. In 1876, William S. Clark arrived to found an agricultural college in Sapporo. Although he only remained a year, Clark left lasting impression on Hokkaido, inspiring the Japanese with his teachings on agriculture as well as Christianity. His parting words, "Boys, be ambitious!" can be found on public buildings in Hokkaido to this day. The population of Hokkaido boomed from 58,000 to 240,000 during that decade. In 1882, the Development Commission was abolished, and Hokkaido was separated into three prefectures Hakodate Prefecture (, Hakodate-ken), Sapporo Prefecture (, Sapporo-ken), and Nemuro Prefecture (, Nemuro-ken). In 1886, the three prefectures were abolished, and Hokkaido was put under the Hokkaido Agency (, Hokkaid?-ch?). Hokkaido became equal with other prefectures in 1947, when the revised Local Autonomy Law became effective. The Japanese central government established the Hokkaido Development Agency (, Hokkaid? Kaihatsuch?) as an agency of the Prime Ministers Office in 1949 to maintain its executive power in Hokkaido. The Agency was absorbed by the Ministry of Land, Infrastructure and Transport in 2001. The Hokkaido Bureau (, Hokkaid?-kyoku) and the Hokkaido Regional Development Bureau (, Hokkaid? Kaihatsukyoku) of the Ministry still have a strong influence on public construction projects in Hokkaido. In mid-July 1945 shipping, cities and military facilities in Hokkaido were attacked by the United States Navys Task Force 38. On 14 and 15 July aircraft operating from the task forces aircraft carriers sank and damaged a large number of ships in ports along Hokkaidos southern coastline as well as in northern Honshu. In addition, on 15 July a force of three battleships and two light cruisers bombarded the city of Muroran. The governmental jurisdiction of Hokkaido incorporates several smaller islands, including Rishiri, Okushiri Island, and Rebun. (By Japanese reckoning, Hokkaido also incorporates several of the Kuril Islands.) Because the prefectural status of Hokkaido is denoted by the d? in its name, it is rarely referred to as "Hokkaido Prefecture", except when necessary to distinguish the governmental entity from the island. The island ranks 21st in the world by area. It is 3.6% smaller than the island of Ireland while Hispaniola is 6.1% smaller than Hokkaido. By population it ranks 20th, between Ireland and Sicily. Hokkaidos population is 4.7% less than that of the island of Ireland, and Sicilys is 12% lower than Hokkaidos. In the east, there are two areas (surrounding, for example, Shari and the Nakashibetsu Airport) where a grid with spacing of nearly 3km is formed by narrow bands of forest. It was designed to buffer wind, especially during blizzards, to protect cattle. It also serves as habitat and transportation corridors for animals and hikers.